It may seem like yesterday that you were holding your baby for the first time. But they quickly grow up and before you know it, they are starting to show teething symptoms. For some, these symptoms can start as early as 4 months, but for others they may not appear until as late as 18 months. Each baby is unique and may show some of these symptoms and handle teething differently. Depending on whether it is one tooth or many teeth coming in at the same time, teething can last anywhere from a few days to months. These symptoms may also start appearing up to a few months before there are any signs of teeth coming through. 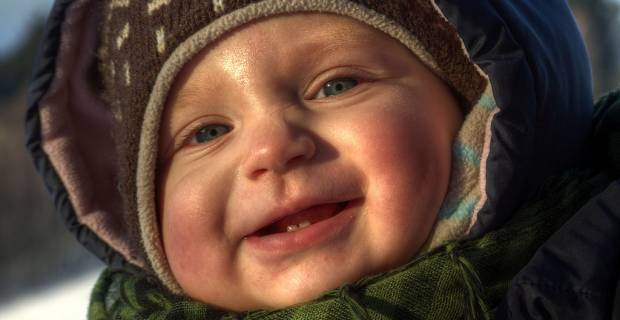 Here is a list of teething symptoms to keep an eye out for. Lots of drooling. This is the most common symptom that you will see when a baby is teething. Teething stimulates drooling as the saliva helps cool the inflamed and tender gums. Teeth are pushing through the gums, so inevitably the baby is going to be feeling a lot of pressure and most likely won’t be happy about this uncomfortable and painful experience. It is important to try and give them more attention than usual to help distract them from the pain. The gums will be sore so the baby may avoiding solid foods that they might have been used to beforehand. Because the ears, gums and cheeks all share nerve pathways, the baby may start grabbing at their ears and cheeks more. Chewing is a major part of teething. It is best to give them chewing toys that will help relieve the aching pressure that they are feeling. If possible, keep the toy in the fridge, not the freezer, as the coldness helps numb their gums. Some babies may not seem like they are in very much pain, so just keep an eye out on their mouth and see if any teeth are coming through. While there are many teething symptoms that the baby may be going through, there are also a few home remedies that you can do to help ease their pain. If they are used to these foods, offer them chilled yogurt or applesauce. Anything that is smooth and cool will be welcomed by them. Try and massage their gums with a clean and cool finger or washcloth.